Is your new hire capable of driving your company vehicle? Are your drivers having incidents? Do you have a driving policy that requires ongoing driver training but you don’t know where to begin? Thinking Driver’s EXPERT instructors are available to evaluate your drivers! An Independent Driver Evaluation is the best way to exercise due diligence to ensure your employees are competent drivers and to discover what training is needed. Get a “snapshot” of your employee’s driving and identify any weak areas or bad habits and correct them through coaching. Prior to undertaking evaluations, we will consult with management to ensure that we include driver, job, policy or environment-specific issues and address any other concerns that may be triggering or be related to the evaluation request. Driver Evaluations typically involve a 2 hour block of time and include vehicle pre-shift inspection, driver briefing, and on-road evaluation in the vehicle that your employee normally drives. 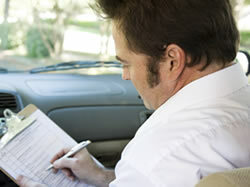 Evaluations cover all basic driving skills as the driver is taken through a series of on road exercises. Following the evaluation, a feedback and coaching session will be included to provide the employee with tips and instruction to correct errors or gaps in knowledge or skills. A written formal evaluation results form, documenting competency, is provided to both your employee and to management for personnel files, along with recommendations, if any, for further action.